"The past holds valuable lessons for the future. Many people will find this book of interest." Lorne Calvert, Premier of Saskatchewan. Bessie Vroom Ellis's life is like a bridge between Alberta's pioneer past and its high-tech present. "Bessie Vroom's story of her life on an Alberta foothills ranch fills a place in history that is not often told. She grew up in country that was as wild as the animals and birds that shared it with her. I knew the Vrooms and rode the same country with them. Bessie tells a great story! I chased horses in the mountains with her when she was about twelve and saw her ride her horse where a mountain goat would have hesitated. There she went, with her pigtails a-flyin', and her horse didn't turn a hair." 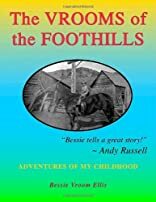 In THE VROOMS OF THE FOOTHILLS: ADVENTURES OF MY CHILDHOOD, Bessie Vroom vividly recounts growing up on her family's Alberta ranch. With the towering Rocky Mountains as a backdrop, her stories are full of the hardships, rewards and fun of ranch life in the 1920s and 1930s. With humor and affection, Bessie tells of: the loving guidance of her parents - Ralph, a dashing cowboy, and Mollie, a courageous ranch wife. riding "Paddy" to fetch the mail when she was only 4 years old. her first brood mare, "Rainbow", and starting her own herd. the cardinal rules for keeping herself and her horse out of dangerous situations. her father riding his bravest horse through a raging forest fire to rescue a crew of lost men. the terror-filled adventure of killing a marauding grizzly bear.